Video games and dancing, who knew? I’m pretty sure most people’s typical idea of a gamer wouldn’t necessarily include “great dancer” among the list of qualities. And as someone that’s tried to teach a few nerds to dance in my time, I might be inclined to agree. Even though most gamers really appreciate music, especially while playing FPSs and many might even be proficient at a musical instrument, dancing just isn’t on the list of must-have skills. And I’m not talking about the Dance Dance Revolution home & arcade games. While those are “dance-based games,” it’s not really dancing. * Fancy footwork, sure, but not really moves you could bust out in the club. Honestly, if you did, you’d probably get the same looks Patrick Dempsey initially got in Can’t Buy Me Love** and someone might call 911 afraid you were having a seizure. Then along comes Microsoft Kinect, the add-on hardware for XBox that is a camera, microphone, body tracker and so much more. As their tagline says, “You are the controller.” Where the Nintendo Wii opened the field, and Sony Playstation took their shot, Kinect is the clear winner for many. Nothing to press, nothing to hold, you just get up in front of your TV and your tracked motions control the game. Much like the Wii, the initial games released were more family-oriented, sports and easy mini-games designed to get you moving, but nothing so difficult that both kids and grown ups couldn’t have a good time. 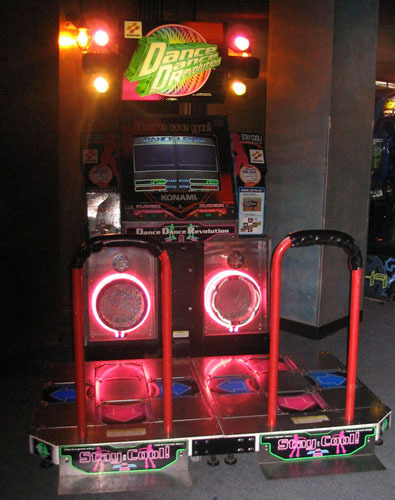 Still, I wasn’t impressed until I saw trailers and ads for the game Dance Central. It’s a f’real-real straight-up dancing game, chaining together simple and complex moves to some classic and current tunes. And while other Kinect games suffer from a little lag in body movement tracking, this one is precise–and often unforgiving. While you mirror the moves of the dancer onscreen, the game is devoting nearly all resources to tracking your body position and limbs. There are even spin moves and some particularly brutal “take it down to the floor” moves that may not faze the seasoned dancer, but this long-retired club kid was working up quite the sweat to earn my 5-star rankings on each song. I was doing ok with some of the simpler tunes: Lady Gaga, Kylie, Pitbull, even songs I hadn’t heard before, breezing through the easier levels and challenges… until I tried to perform “Crank That (Soulja Boy).” It’s one of those songs that has a specific dance to go with it and sometimes tells you how to do the moves or just calls out the moves as it goes. Pretty well-known to anyone that spent a little of their lunch break surfing YouTube in 2007… and kinda hard to do. I can’t embed the video, but check out MightyMeCreative’s Dance Central video on YouTube. She aces most songs, but even she had a little trouble with this one. *** What is a “little trouble” for her had me praying for release from the torture that was that song. And just to crush what little pride my ego had, it turns out that even 62 year old singer Lulu is better at this dance–for charity, anyway–than I am. Dance Central, at times, is a little bit of a workout and at others it’s an unrelenting dance coach–a la Debbie Allen from Fame–that berates your every mistake and barely deigns to acknowledge your successful moves. And yet, it’s still a lot of fun! It must be fun because I keep going back to it every few days to torture myself and work up a sweat. My only problem with it is that the game, for all its ads of being a party game, is really a single-player game. It allows for multiple people to dance with you, but it’s really the one player it’s paying attention to. There’s a Dance Battle mode that lets you switch off with another player, but even that falls a little flat as it’s just each of you doing the full dance with an intermission to trade places. 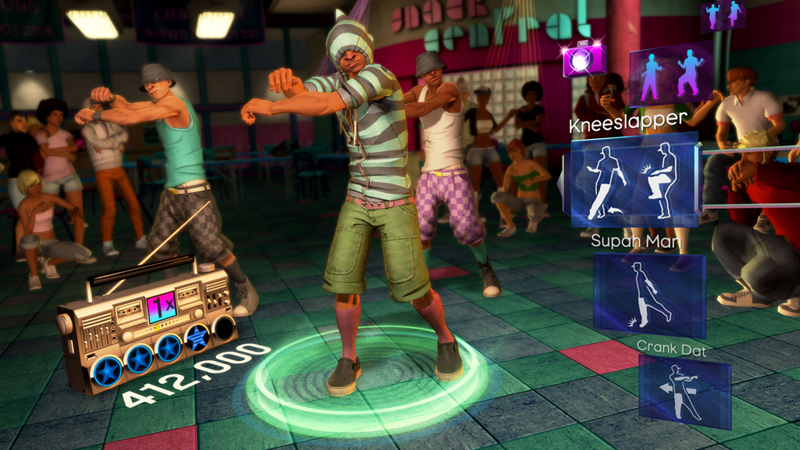 The developer is already thinking about Dance Central 2, so we’ll see what the future holds. Until then, I’ll head home, pop on my headband & legwarmers and humiliate myself under the watchful eye of the Kinect. * Unless you’re these guys. ** Unless you have a dance partner mirroring your moves. If manufactured pop bands have taught us anything, it’s that any dance move looks good when you have at least 4 other people doing it along with you. *** Admittedly it was only on her second day of owning the game, but she’s still tried it more times than I have. Previous story wednesday wishes: Me wantee! Q wants a Kinect, but I still think I want a Wii.